The Japanese Ministry of Education has come up with a rather extreme approach to treating internet addiction in teenagers; “fasting camps”. These will take the form of “outdoor learning centres” without access to wifi, where participants will be encouraged to engage with others through games and sports. And as the gap between traditional journalism and online content continues to close, Time has allowed Twitter users to get in on the decision-making process for 2013’s Person of the Year. Anyone can vote for their favourite candidate using the hashtag #TIMEPOY, before December 4th, when the editorial team at Time will then make the final decision (however, the number of votes will only be a factor for consideration; it will not determine the final selection). Nominees include activist Malala Yousafzai, new-born royal Prince George, professional shock artist Miley Cyrus, and whistle-blower Edward Snowden. There’s been no avoiding the fact that our American pals celebrated Thanksgiving this week. Which in the world of e-commerce means only one thing: Black Friday, the shopping frenzy that occurs every year after everyone is done giving thanks. This year, a wide range of retailers enabled their customers to use digital currency Bitcoin on special deals. Notably, mobile gift card app Gyft gave Bitcoin users percentage points back when they bought gift cards from big names like Target, Gap and Nike. Bitcoin has had a long and arduous journey towards credibility – might this inclusion in the festive retail period be a sign of things to come? Perhaps, but until retail giants like Amazon and eBay get in on the action, Bitcoin will in all likelihood stay on the sidelines. What Were Tech CEOs Thankful For This Year? Ever wonder what the Mark Zuckerbergs and Marissa Mayers of the world express their gratitude for on Thanksgiving? 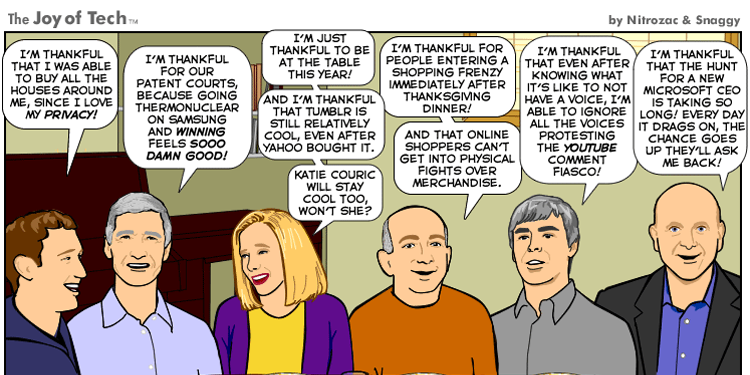 Well now, thanks to a superb webcomic by Nitrozac and Snaggy over at The Joy Of Tech, there’s no more need to speculate. Enjoy!